i realize i am taking a risk with this post. many of you might scoff and gawk and immediately click out of this web window and unsubscribe to my blog and say sayonara forever. but i have to come clean. i have to come out of my over-stuffed closet. and i... uhhh... don't scrapbook. i can see your jaws drop and your heads shaking in disbelief. i know, i am as ashamed of me as you are. although i love you scrapbookers, you stampers and sticker friendly friends, you ladies who stay up late at nights with your heidi swapp rub ons and your transparent overlays and your glue dots, brads, eyelets, ribbon and fancy chip board 3D shapes. i, unknowingly have cured my scrapbooking bug. i used to be one of you. i even worked among you. and i have gobs of evidence stuffed in drawers. because i have cute handwriting, i fool a lot of you. but somewhere between then and now, my life took over and i ended my scrapbooking jaunt with our dreamy trip to paris, circa 2004.
and now, when i think about scrapbooking and think about all the newest, latest, greatest items i could blow my credit card limit on, all i feel is this dreaded cloud of doom. it's crazy talk, and i don't logically agree with any of it, but this is what the voice says inside my head: i can't start unless i can do it perfectly. and i can't just pick up with my recent photos. i have to do the reunion from two years ago and then our trip to japan and then i'll feel super bad if i don't scrapbook about thanksgiving in sun valley or that time dan surprised me with a limo (a limo, people!) and took me to a romantic dinner downtown at the most fine place i've ever dined with lovely linens and caesar salad made fresh, right in front of me. and then how could i leave out all the nieces and nephews that have been born and all the random roadtrips and camp outs? and what about the hike that nearly killed me or living in california and the mud run in san diego or all the dreamy broadway shows we've seen!?! after the little chat with the voice inside my head, i curl up and eat a hidden ball of cookie dough from the freezer and go to bed and try to forget the confrontation altogether. and my photos wait. silently, patiently, sweetly in iphoto dreaming of their someday, their big day to debut. i know. i am so mean to my photos. there are so many lovely ones, i feel like i am hurting their feelings. and i am supposed to be the creative artistic type. how did digital scrapbooking come into play without my knowledge?! how could i be so ignorant in a field that i love? meanwhile, the '08 resolutions on the page are pretty much like a pathetic crossword puzzle i've been saving to do all year (filling in the easy ones when i have time). july is well upon us and time isn't slowing down any time soon. and let's face it, when the babe comes, who knows what else will be out the window of life as i know it. so i have come to a decision. i have decided to stop feeling bad about my disease of not scrapbooking. no, no, i am not giving it up forever or parting with my pinking shears. i am simply putting it off officially. and the funny thing is, suddenly, once i made this decision, i felt a whole lot more motivated to get into action. i've come up with a simple solution. duh, why i didn't do this before is my guess. probably that voice in my head telling me that it's not a real scrapbook. however, whether this be temporary or forever, i am feeling all proud because as you scrapbookers say, i'm all caught up. hooray. and now that i've made my little confession, i can move on and get on with life and take more photos with no regrets whatsoever. Thanks for coming clean! Hi, I'm Annie. And I am a non-scrapaholic, too. I've found the joy of photo books through shutterfly, snapfish, apple, etc. Upload photos, choose style and captions (if you want). Beautiful finished product + no more guilt :). I don't scrapbook either (though I am very intrigued by the scrapbooking industry...) so we're all in good company! 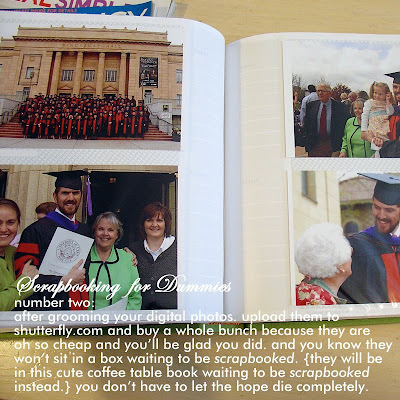 I'm so glad I'm in good company in my non-scrapbooking world! I actually started making cards because I always bought supplies for scrapbooking, but never used them. I could never commit to a layout for a page...what if it wasn't perfect? What if I changed my mind? (I know I could just re-print my photos...but that's beside the point). So I had to use my suplies to make cards so I didn't feel so guilty! Anyhow, I also don't scrapbook. Thanks so much for making me feel better! Keeping it old school, I like it. I do digital scrapbooking which I love, all my supplies in one handy little computer program and absolutely zero clean up, my kind of craft. But I also have a collection of normal photo albums that get ALL the pictures, letters, ticket stubs, not necessarily captions, but you can follow the journey of my life through the past eight years and I dig it. Well done! I am proud to say, I am right there with you. One page used to take me a 1/2 hour or more, and with all the photos I have from my senior year of high school and on, I just don't have time. I've been doing the same thing you are, and its so much easier. I'd rather have them to look at then sitting in a dusty box waiting to be decorated. I am in the same boat with all of you. I have decided that the books you can make in iphoto are WAY more up my alley these days. They come out looking nice, but I have to put in very minimal effort. I'm actually caught up on my 8.5 month old's baby photos, that's how easy it is! He'd be 5 before I did his first 3 months, otherwise. Love, love your blog. You inspire me each day. My journal is full of "m. writes...". Thanks! I am a scrapbooker but I don't scrapbook everything in the world. Infact I have very little to show for my efforts! However, the greatest advice I could EVER give you would be to pick up Ali Edward's book, Life Artist. She addresses absolutely every concern you have. It is a fabulous, inspriring, practical book. It would be perfect in helping you start again. I think that there are more of us out there than you think...I've very intrigued by and impressed with all those crafty people who take the time to make everything pretty & perfect. But I get overwhelmed and start to worry that it won't be perfect and what if I decide that I hate the photo that I just cut into a heart shape. 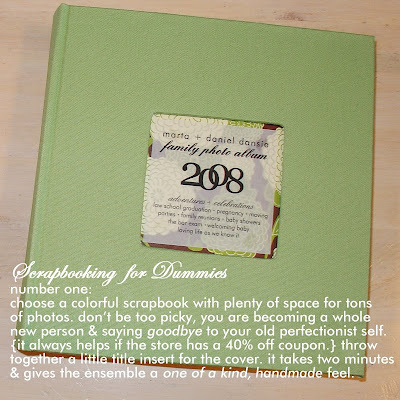 Not worth the anxiety... Picasa albums with the occasional print made for a frame or bulletin board keep me happy! yea for non-scrapbookers. although i'm an even bigger slacker in that i rarely print actual pictures. i just enjoy them on my computer. slacker. but if i went back through the past 4 1/2 years that i've had a digital camera and tried to print them all... AHHH! I just need to go back and pick the best ones and have a fun photo book made... someday. Wow! Let's all be friends--non scrappers unite! Seriously, I just cannot do a scrapbook page, way too much anxiety over it being perfect. M- Thanks for coming clean. You are a brave woman to do that in this scrapbooking world! don't scrap book- don't wanna- don't get it. That's all right. We scrapbookers still love you. And any time you do decide to switch over to the dark side, we'll welcome that beautiful handwriting of yours with open arms. I haven't really scrapbooked in a year. I used to love it. I have a ton of stuff to use. The only scrapbooking I am doing is Elise Blaha's Paper Adventure, which I am now behind on. Other than that I have my brother's wedding book to finish...from two years ago....and a pile of stuff that I *want* to scrapbook, but other things get in the way of my urge. Alas, I am about to just buy an album like I used to and skip the fancy top loading albums that I switched to and just do it how I used to. Glue, scissors and photos and a little note about what it all was. yeah i'm teetering on the edge of this... have the best intentions to scrapbook... had so much fun doing it in college... can't seem to get back up on that horse. i respect both sides though. people need hobbies and i'm glad so many people have found joy in this one. Silly Marta, your blog is your scrapbook! Amen!! Go ahead Marta! It is okay to be the "creative one" and frown at the scrapbook materials. A couple of my girlfriends and I finally confessed that to each other also. What a relief to let go of the perfectionism of doing it all. I love your new scrapbook, it's bright, organized and thoughtful. Great Job! that's my kind of "scrapbook." :) now i just need to actually print out my pictures and put them in a book, because i have yet to do even that. I love that there are all kinds! 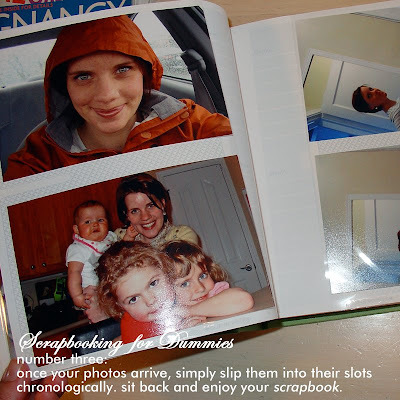 I scrapbooked for a bit in 2000 and then dropped it like a rock for almost 7 years, only to start again b/c my daughter was crestfallen that there were no pics of her in our 1 album (she was 4 by then). So I picked it back up for the kids and, honestly, to meet some people. I'm liking it for now. It feels good after designing for years with other people in mind just to make something for me. ah...I feel better. thanks for opening this can of worms. I have many unfinished books...all for the same reasons you mentioned. Too many options. I walk into that aisle at Michaels, JoAnns, and the like and it's immediate sensory overload. That's why I love blogging. No fancy scissors required. You can always print your blog at Blurb.com...but it may be pricey. scrapping is what you make of it. it doesn't have to conform to any one idea or a set of particular techniques as you have shown with simply putting them in an album. i've got 20 yrs of photos that need sorting. some are organised. it can be overwhelming but i just try to be more diligent with current photos and take loads of deep breaths. putting them in an album with at least some sort of date, event, names, etc is so important becasue you can come back and add if you choose. i do not "scrapbook" either. and using acid free products. 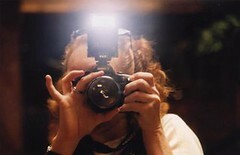 and taking photos at events. yep. and another one bites the dust. hi. i am Heather. i have been a non-scrapper for 8 years. I say do what you do. People save memories in words, in quilts, in drawings, in gardens and in scrapbooks. It doesn't have to be a lifelong commitment. Who are we doing it for anyway? We'll be disappointed if we think our posterity is going to pour over our artistic creations for hours every time they visit. (How often do you read your mom's poetry?) Once we accept that we're creating something for our own enjoyment we're free to do what we do, when we feel like it! I agree with all of you. I think there's much better ways to use photos without having to cut them into a bazillion shapes. I hear you loud and clear. It's expensive and time consuming and space consuming and so daunting...I just use black or white papter and photo corners and that's about it. I'm tempted by all the cute paper. Really Really tempted. So maybe M's album will have more personality. Im there... The voice in my head and I talk about this often. but my voice is telling me, GET A CAMERA... i know. I feel guilt. i don't even have the pictures to scrapbook. (sigh) someday i will stop worrying about what camera to get, and just GET ONE. and start capturing memories! Oh happy day! A woman after my own heart! My scrapbooking skills consists of buying the albums with the sticky back, peeling back the plastic, slapping my photos down, and pulling the plastic back over them! I think that's why I started my blog. It was a fun way to post pictures that I can look at everyday! I say a resounding "Good for you!" Why? I hate when people make me look at their scrapbooks (not matter how cool they look). Don't they realize that they are only interesting to those that make them?